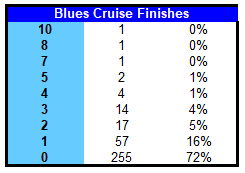 Who’s Running 2018 Blues Cruise 50K? I’m always curious about the other crazies that run ultras so I’ve started looking at the demographics of those that run the same races I do. All of the data below was pulled from Ultrasignup and while I’ve found it to be fairly accurate (i.e. all my ultra finishes are listed there), it’s not going to be perfect. It is close enough to give a good idea of general racing histories for my purposes. The ladies, they love their Blues Cruise. When I’ve done this before for longer ultras, men had dominated the start lines (80-90%) so it’s nice to see the women at 42%. The unsurprising thing is to see so many runner in the 40-49AG. I don’t know what it is about middle age that sends so many people into ultras, but it’s definitely a thing. The total races stat are based on what has been listed in Ultrasignup. While they have a decent number of sub-ultra distances listed, they’re typically only trail races and it’s definitely not all encompassing of someone’s racing history. More a comment on their trail racing history, which is rather modest for the field as a whole. 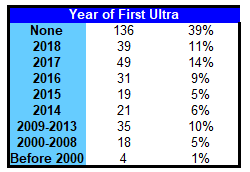 This race sells itself as a good entry to ultramarathons (it is) and that’s exactly what the above chart shows with 39% never finishing one and half the field having less than a year ultra experience. I remember when I ran this race back in 2014, I had parked next to a car with a Western States license plate. It was my third ultra and I was a more than a little insecure standing at the start line. I just assumed that everyone else was this uber-experienced runner and the truth was probably that most of them were just like me. Three quarters of the people on the starting line Sunday will be running the race for the first time and most of the others for the second or third time. I have a lot of respect for those with 5 or more finishes. It’s very difficult to have any kind of longevity in this sport and it’s impressive to see. Good luck to everyone heading to Blue Marsh Lake next weekend.